Q: There are plenty of bells on the market. What makes ours worth a look? A: Because Arundel bells are worthy of going on a super nice bike. Our bells have a stainless steel thumbscrew so you can install or remove the bell with no tools. We had the option of plastic to save money. Of course, we picked the hardest alternate route possible. We spec’d our own stainless thumbscrews so they won’t rust. The thumbscrew is for easy removal. This comes in handy if you’re trying to set fast time on Strava, for example. Remove seat bag, remove pocket change, install race wheels, wear pointy helmet and remove bell. Unless the Strava segment is on a multi-use bike path – then you might consider keeping the bell. We’re kidding. You know that, right? Don’t scare the joggers. 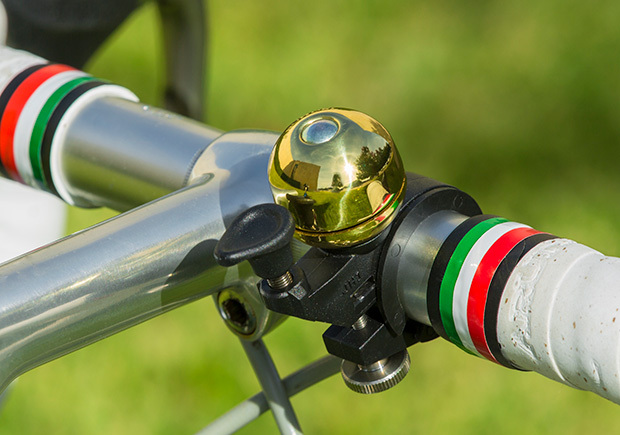 Most bike bells are designed for kids. They have small clamp diameters for that reason and often have colorful themes that probably do not appeal to Cervelo riders. Arundel bells are sized for 31.8 bars and also have a shim to go smaller. This is not common. Yet this is a requirement to fit an enthusiast bike. Ours have a good ring to them, pun intended. No kidding, some bells sound crappy. Our bell maker is a Taiwanese guy about 70 years old, who’s been making bells for 30 years. When he talks bells, he’s usually talking about how they sound.